There are tens of thousands of nerves in your body. They play a very important role, serving as the body’s wiring system. Their main task is to carry messages between the brain and the rest of the body. While some nerves are responsible for carrying messages from the brain to the muscles in order to make the body move, there are other nerves that send messages about pain, pressure or temperature from the body to the brain. To help carry the messages properly, each nerve has small fibers bundled inside it, covered by an outer layer that insulates and protects them. However, at times, nerves become damaged. 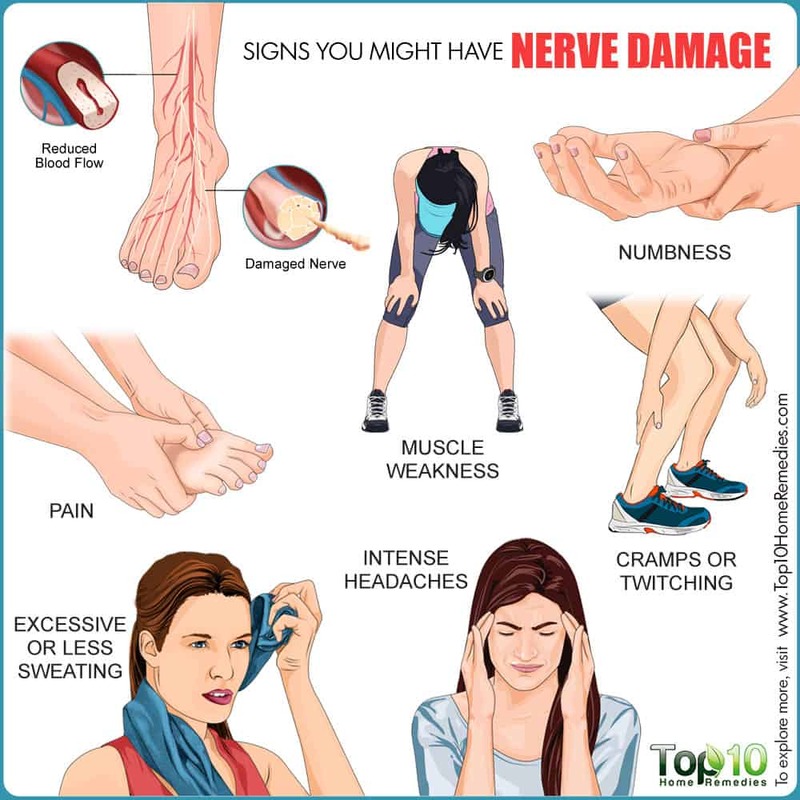 An estimated 20 million Americans suffer from peripheral nerve damage, also known as neuropathy, according to the National Institute of Neurological Disorders and Stroke (1). There are many possible causes of nerve damage. It can be due to too much pressure on a particular nerve, caused by stretching or by a cut. Other causes and contributing factors include diabetes, repetitive motion, Lyme disease, excessive smoking, excessive drinking, aging, vitamin deficiencies, exposure to toxins, infections and autoimmune disorders like hepatitis C, diphtheria, HIV, Epstein-Barr virus, rheumatoid arthritis, and Guillain-Barré syndrome. Irrespective of the reason behind the nerve damage, the signs and symptoms generally develop slowly. But sooner or later, you will experience certain symptoms that give a clear indication that you might be suffering from nerve damage. If you notice such signs or symptoms, consult your doctor right away. Here are some key signs that you might have nerve damage. When it comes to sensory nerve damage, the first signs that you may develop are numbness and tingling sensations, especially in the hands, fingers, legs, and feet. The sensory nerves are responsible for transmitting sensations. When these nerves are injured or damaged, you may experience some tingling sensations in the hands or feet that can eventually result in numbness. If not treated, the numbness could spread to other areas of the body. The problem can become severe, ultimately interfering with your daily routine or your sleep. Some other reasons behind numbness in the hands and legs are constant pressure on your hands or feet, exposure to cold, temporary nerve compression, a sedentary lifestyle, and a nutritional deficiency of vitamin B12 or magnesium. Another common sign of nerve damage is sharp, stabbing or burning pain. This kind of pain usually develops in the hands or feet and feels different than other types of pain. You feel the pain due to an injury to the sensory nerves that carry sensations to the brain. When the nerves are damaged, the transmission of sensory signals between the brain and the skin is not up to the mark, resulting in moderate to severe pain in the affected areas. The area of pain may be widespread (diffuse) or limited to a single nerve or several nerves. Also, this kind of pain often becomes worse at night. A 2006 study published in Current Neuropharmacology reports that neuropathic pain quality rekindles the psychophysical experience of peripheral nerves intraneural microstimulation, i.e., a combination of large and small fibers sensation temporally distorted compared to physiological perception evoked by natural stimuli (2). Apart from nerve damage, you may develop nerve pain due to diabetes, vitamin B12 deficiency or an injury to the brain or spinal cord. There are some nerves that give you the ability to move. Any kind of injury to nerves that carry motor signals will cause some amount of muscle weakness as well as loss of muscle control. First of all, the damage will disrupt the signals that would transmit via the nerves between the brain and the particular muscle group. This can cause difficulty walking or problems with fine motor skills needed to pick up something or grip something tightly. Secondly, when the affected muscle group is used less due to nerve damage, the muscles will weaken over time. This ultimately causes more difficulty performing certain motor functions. Apart from nerve damage, you can have muscle weakness due to myasthenia gravis, Parkinson’s disease, rheumatoid arthritis, slipped discs and even a stroke. Any kind of damage to motor nerves can cause frequent muscle cramps or twitching. Since the motor nerves are interlaced with the muscles, even minimal nerve damage can result in muscles cramps. At the same time, cramps and twitching can further pull on the nerves, potentially causing more damage. While muscle cramps are caused by the continuous firing of multiple motor nerves, twitching is caused when one or a few motor nerves misfire. Cramps or twitching associated with nerve damage can vary in severity from mild to intense and extremely painful. Muscle cramps can also occur due to over-exercising, dehydration or a mineral deficiency. Damage to nerves that help the organs and organ systems function can cause a condition called autonomic neuropathy. When the autonomic nerves are affected, it can result in perspiration problems. While some may experience excessive sweating, particularly in the upper body and head, others may notice less sweating, which can prevent regulation of body temperature during rigorous physical activity. A 2009 study published in Deutsches Arzteblatt International found that sweating may be peripherally increased at the onset of a polyneuropathy and may disappear as nerve damage progresses (3).